Canary Wharf is famous for its choice of bars, restaurants and events. It's a busy, buzzy place where something is always happening, and life is always changing. Competition is high yet there is something about Rocket that tickled my fancy. From a distance, Rocket looks intriguing, yet inviting, with its earthy, yet somehow modern logo. The exterior is a great reflection of the interior: fresh, natural, modern and classy. The presentation of the restaurant leaves expectations high and, thankfully, you will not be left disappointed after your visit. Rocket is spread over two floors, with the ground floor being a trendy bar, serving delicious Cocktails, Wines, Champagnes and Beers. The terraced area is heated ensuring you can enjoy the outdoors, whatever the weather. The bar opens from 10.30am Monday to Friday, meaning it a popular spot for both the lunch and after work drinks crowd. The first floor comprises of an indoor restaurant and al fresco mezzanine, once again meaning you can enjoy yourselves all year round, whatever the weather. The restaurant has a chic vibe; suitable for business meetings, romantic dates or a catch up with friends and family. Rocket seems to have perfectly captured a setting to put all walks of life at ease. There are options for group bookings, meetings, and parties, as well as planned upcoming events. 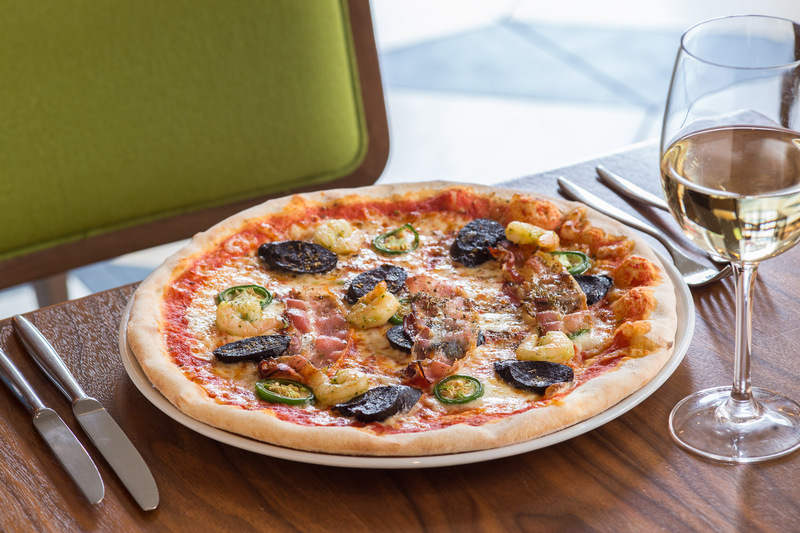 The restaurant opens at 11.30am Monday to Friday, offering a huge range of fresh salads, grills and mouthwatering 12” stone baked pizzas. The menu choice is plentiful and the dishes are cooked to ultimate perfection every time, in my experience, making Rocket the first choice for a meal in Canary Wharf. They certainly live up to their motto of: 'Expertly sourced, fabulously fresh food and drink'. The dishes are exquisite, although not over complicated, and perfectly teamed with the excellent drinks menu. As if the reputation, food and drinks menu and setting wasn't enough to entice you, Rocket Canary Wharf have also launched a Summer offer to keep things fresh. From 5pm Monday to Friday, if the weather outside is frightful, wet and dreary, visit Rocket Canary Wharf to brighten your spirits. All you need to do is show the Rocket staff your much-needed umbrella on a rainy evening and you will be rewarded with a generous 2-4-1 offer on any of their delicious, infamous pizzas from their a la carte menu. Rocket make the Great British Summer a win-win situation: if it's sunny, we're happy, we get to relax on the terrace with a refreshing beverage. If it's wet, we're happy, we get looked after in a stylish restaurant at half the price we would usually pay. The exclusive rainy evening offer is only available throughout July and August, so start that rain dance and pay Rocket a visit. My only warning is to you, that once you've tried it, you will become a regular visitor as it is such a welcoming experience, you will be left wanting more.